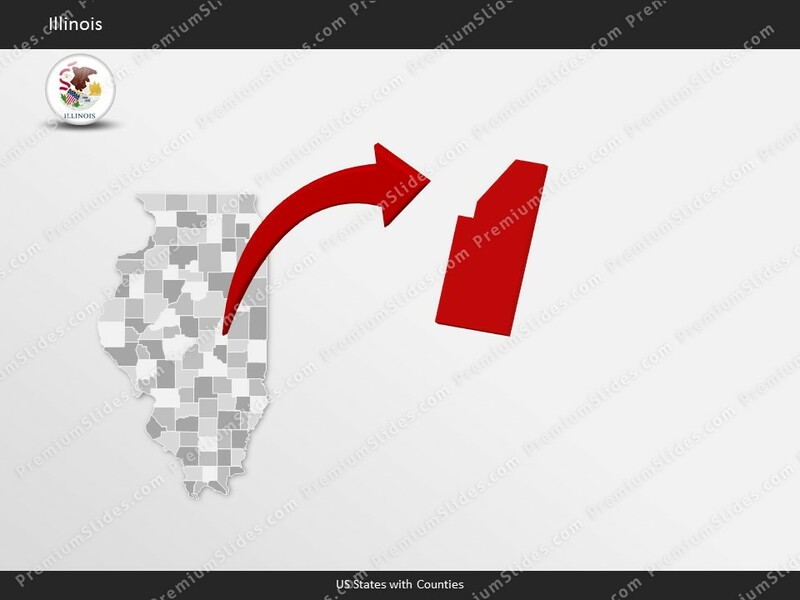 Premium PowerPoint Map of US State Illinois. 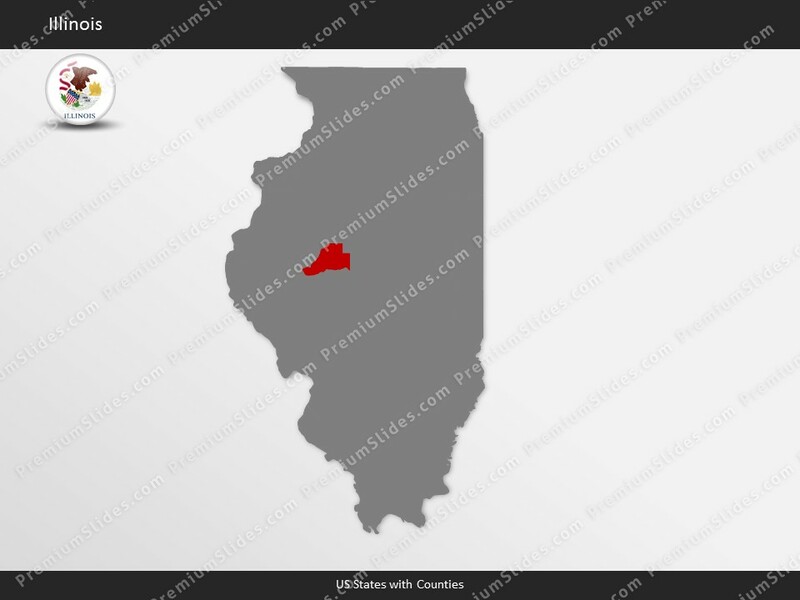 This detailed PowerPoint Map Template shows Illinois counties, county names and biggest cities including the Illinois state capital. 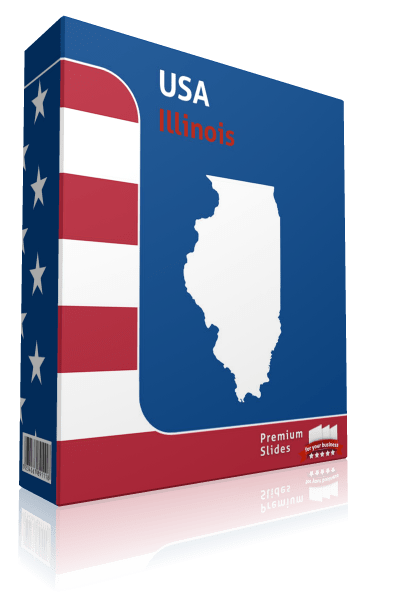 Premium PowerPoint Map of US State Illinois. 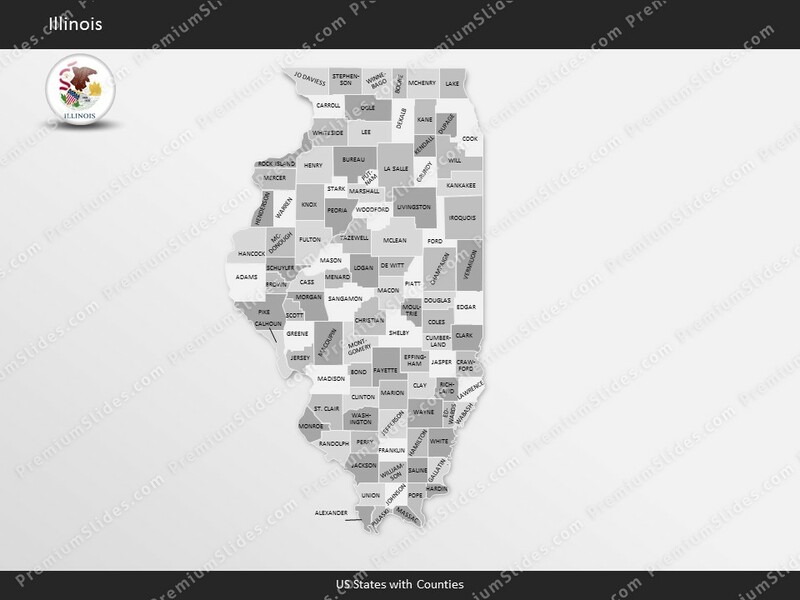 This detailed PowerPoint Map Template shows Illinois counties, county names and biggest cities including the Illinois state capital. 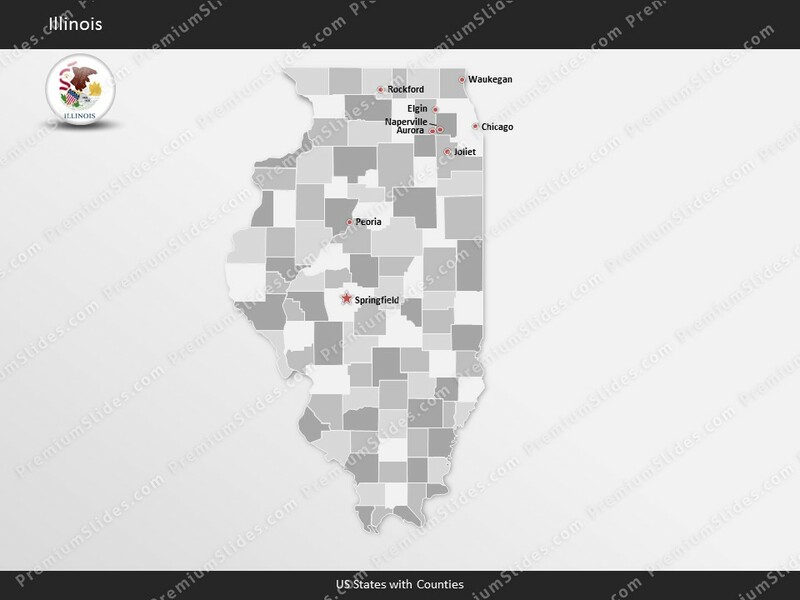 The Illinois PowerPoint Map is hand drawn and fully editable in size and color. Specific territories can be highlighted easily with just 2 clicks in PowerPoint. 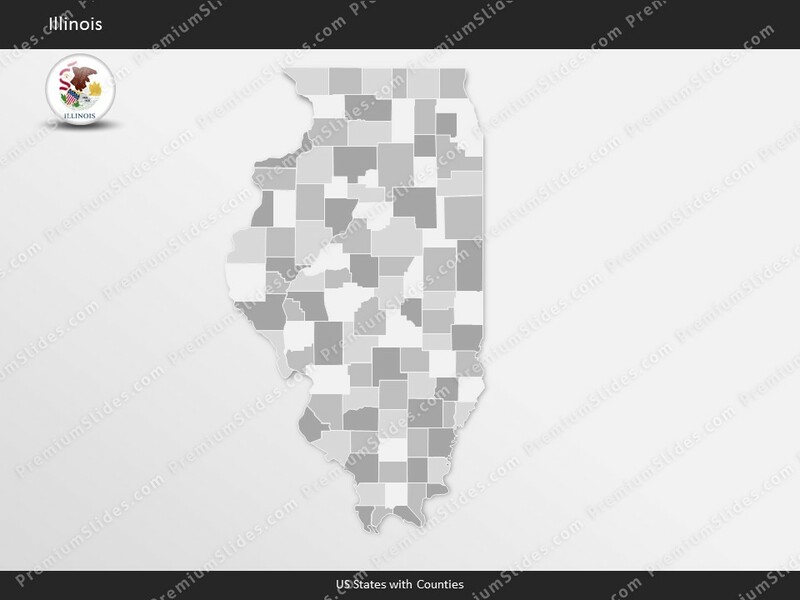 The Illinois Map Template is a great benefit for showing sales data in this state. Do not wait! 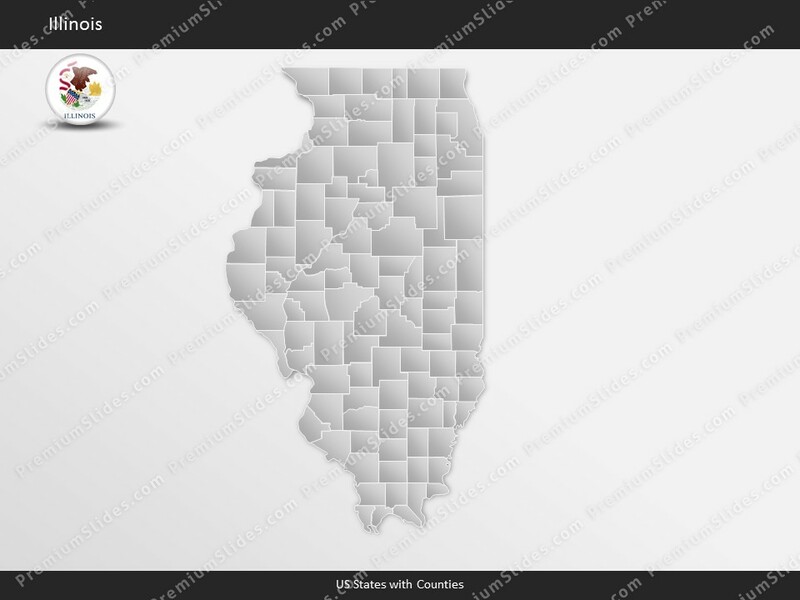 Get this Premium Illinois Map Template for an unbeatable price today and impress your audience in your next meeting! Facts and information about Illinois State you can use in your presentation. Illinois (IL) is also known as the Prairie State. The name Illinois comes from Algonquin for "tribe of superior men". The date of admission to the Union was on December 3, 1818 out of Illinois Territory (part). It is the 21st state to joining the other constituent entities. The motto of the state is: State sovereignty, national union. The total size of this US State is about 57,916 square miles. Therefore Illinois ranks in 25th place among all other US States in terms of land area. Actually 55,518 square miles are covered by land and 2,398 square miles are covered by water. The mean elevation is 600 feet. Illinois's highest point is Charles Mound with a height of 1,235 feet. The lowest place is Mississippi River, which is 279 feet. Its geographic center can be found in Logan County, 28 miles northeast of Springfield. Illinois is bordered by the following states: Indiana, Iowa, Michigan, Kentucky, Missouri, Wisconsin. In 2015, 12,859,995 people lived in Illinois. The majority of people do not live in the capital Springfield. They live in the largest city Chicago. The residents are called Illinoisan. Illinois is the birthplace of these presidents: Ronald Reagan was born on February 6, 1911 in Tampico (In office January 20, 1981 – January 20, 1989). Illinois is known for these industries: Machinery, food processing, electric equipment, chemical products, printing and publishing, fabricated metal products, transportation equipment, petroleum, coal. Illinois is significant producer of agricultural products, including Corn, soybeans, hogs, cattle, dairy products, wheat. Illinois ranks 5th as the most visited place in the United States. Illinois is part of the region of the the Midwestern United States. This region is also called the American Midwest. The United States Census Bureau has the Midwest characterized as one of the four geographic regions. The region covers the northern central part of the United States. Before June 1984, the Midwest Region was also designated as the North Central Region by the Census Bureau. Today this expression is not commonly used any longer. Generally the geographical region has not been modified since 1880, and is nowadays commonly used as a standard for data tabulation. The relatively common definition is made up of 12 states in the north central United States: the East North Central states of Illinois, Indiana, Michigan, Ohio, Wisconsin and the West North Central states of Iowa, Kansas, Minnesota, Missouri, Nebraska, North Dakota and South Dakota. According to Simon and Schuster the area is well balanced between heavy industry and agriculture. A sizeable part of the land area forms the United States' Corn Belt. With its central location, it provides transportation crossroads for railroads, river boats, cars, airplanes and trucks.